Over the past week, my wife, my children, my parents and I all went on vacation to the Dallas/Fort Worth area (we had planned a longer road trip, but we made an on-the-fly decision to just stick around DFW). While there, we visited family and saw a large number of sights and events in the area. Before the trip, I collected suggestions for free things to do in the area from both readers of the site and on Twitter. The response was pretty surprising, with lots of great suggestions thrown our way. I collected all of the ones suggested by multiple people, selected the handful that I was sure would be a hit with my family, and we tried out several of them. So, here are the great free things to do in the Dallas/Fort Worth area. Here are the four free things we really enjoyed on our trip. We tried several things, but these stood out from the pack. 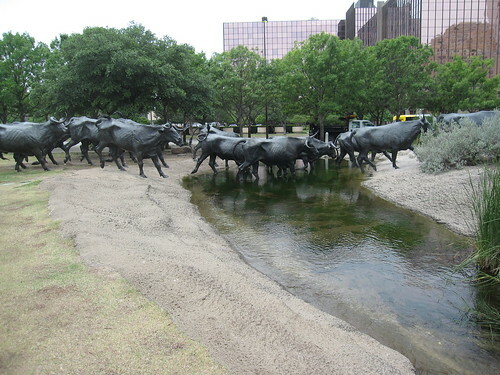 Pioneer Plaza is a beautiful park in the middle of Dallas that features a life-size bronzed cattle drive – three cowboys herding a lot of cattle across a stream. The setting is beautiful and the sculptures are fantastic. We wound up spending almost two hours here, even on a hot summer day. We admired all of the bronze statues, walked across the stream a few times, and my children petted a horse ridden by a Dallas police officer. It would have been a perfect place to have a picnic had we been more prepared. You can find out more about Pioneer Plaza from the Texas Trees Foundation. What can I say? I love farmer’s markets. There are tons of fresh food samples, opportunities to buy delicious produce at a very low price, and almost always a surprise or two. The Dallas Farmers Market, on the quiet Wednesday morning that we were there, was sparsely crowded but had a lot of vendors happy to talk and offer samples of all kinds. 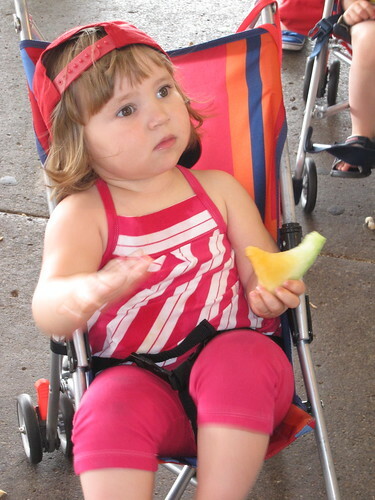 In the picture above, my daughter was discovering that she loves watermelon – she was trying a (free) piece of yellow watermelon. We wound up buying quite a few fruits at the market, which provided afternoon snacks for the family and some breakfast food as well. You can find out more about the Dallas Farmers Market at their website. This is the area where President Kennedy was assassinated in November 1963. You can stand outside the School Book Depository and observe the route that Kennedy took. There’s also a lot of public works projects in the area, built in the 1930s. Although there is actually a very nice museum nearby in the School Book Depository, I found that the actual setting outside the Depository had much more of an impact. I walked along the route that Kennedy took, absorbed the area, and thought about that tragic moment. Wikipedia has an excellent entry on Dealey Plaza. Over in Fort Worth, we visited the Stockyards. 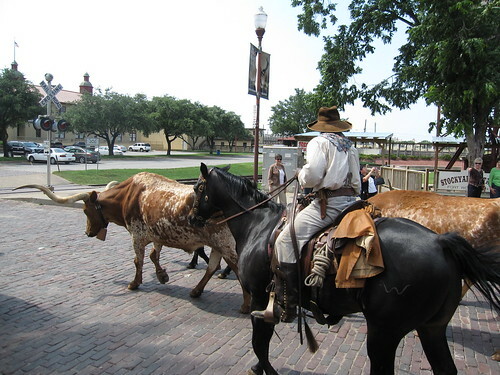 While there are a lot of shops in that area, there’s also a ton of free things to see and do – walking around the stockyards themselves, for starters. There are several free special events each day as well. The highlight, though, was seeing the longhorn steers being leisurely driven down the street by three or four cowboys (pictured above). My son loved this part and kept talking about it for days afterward. This is a great way to spend most of a day in Fort Worth. You can find out more at the Stockyards website. Here are five free activities recommended by multiple readers that we simply didn’t have time to make it to on our trip. All of these sounded like quite a bit of fun – and we would have likely done all of them had our trip been a few days longer. Each summer, the Dallas Museum of Art has a free concert series – in 2009, this series is called “Jazz Under the Stars.” Each Thursday at 8 PM, people gather at Ross Avenue Plaza, spread out blankets and picnic baskets, and enjoy a free outdoor concert by some very good jazz ensembles. The Crow Collection of Asian Art is a beautiful art museum located in the Dallas Art District that several readers raved about. It’s right in the heart of the city and features a stunning collection of Asian art, both historical and modern. Outside, there’s an extensive sculpture garden, which includes 20 statues from the French masters. Find out more at CrowCollection.org. This is a large collection of historical buildings from the 19th and early 20th century, maintained in a state as close to the original as possible. For people into folk history, this is apparently an exquisite place to visit. You can find out more about the Farmer’s Branch Historical Park here. The Morton H. Meyerson Symphony Center is a spectacular concert hall with extremely impressive architecture and acoustics. Built by I. M. Pei, the Center also features one of the best pipe organs in the United States. Check it out at MeyersonSymphonyCenter.com. This is an open area in the center of downtown Dallas dedicated to the idea of giving thanks as a universal human value. The location features an interfaith chapel, a stunning courtyard, and an impressive array of nature and art. Find out more about it at ThanksGiving.org. Believe it or not, our summer vacations for the next five summers are penciled in right now. For each of those trips, I intend to do the same thing: ask around for free things to do, try out as many as I can, and report on the ones we didn’t make it to.